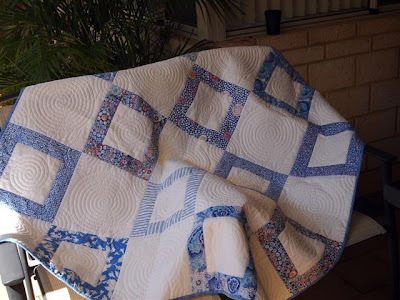 Hmmm, a little bit to chat about today - all you lucky girls at Queensland Quilt Show - congratulations to all the winners and I hope everyone is spending lots of money, lol! 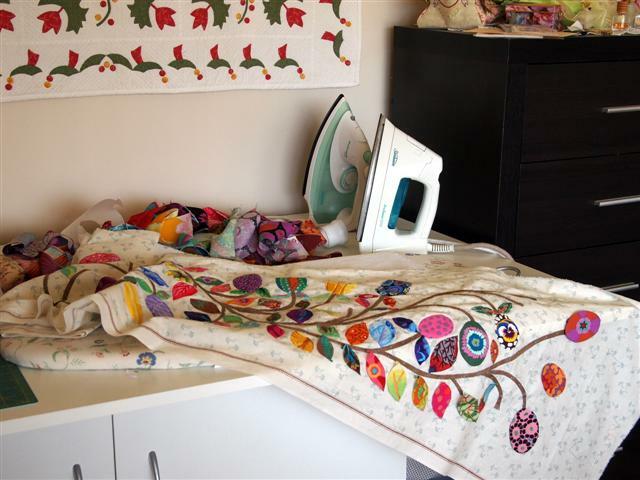 Now this is only prepared and stuck on - just had to try working on large pieces using Kaffe fabrics! Wow! A bit of a shock at first - that fussy-cutting certainly needs a lot of the fabrics that are just right! It has been a fun day and now I will be able to have a lazy evening! Red Emperor fish from Exmouth for dinner, yum! I've been doing a little thinking about time-management in my life. I really have no reason to be slack now - I just have to accept my disability and get on with things that have been too hard - I can use my left hand to manoeuvre the handbrake on the car now. DH is still happily preparing dinner each night - sometimes a little groan and then he's back to thinking about it next morning. 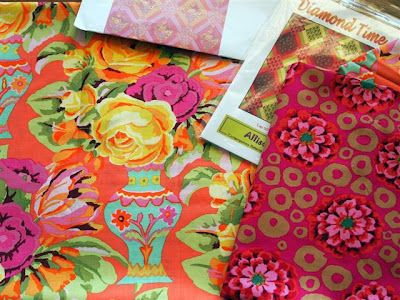 So, I've been thinking - maybe computer time has to be more organized - it is too easy to spend time browsing - I know every store in the world and every line of fabric they carry, lol!Hmmm, blogging time - I was very busy the other day doing Replies, then had severe guilts and deleted everything in my Inbox. If you are waiting on an a answer to a question please forgive me and write again. 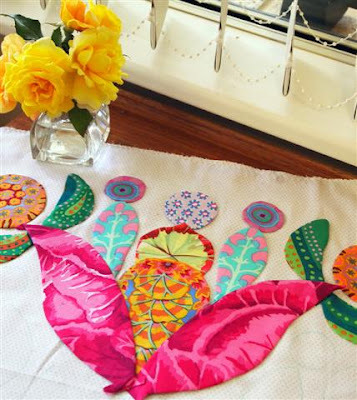 Also, seeing I am doing so much appliqueing lately, I think it will be nice to Post just once a week - let's see how these plans go! 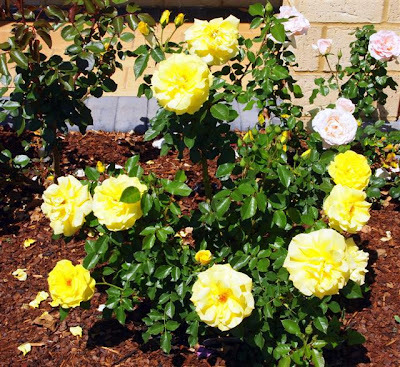 I'm even going to get into the garden tomorrow and dead-head the roses in this glorious weather, but do you really want to know that, lol! It's a big buzz for me as it is going on eight months since I last got my hands dirty! I told you I know what's in every quilt shop in the world - now isn't this interesting, in a nice way that is! Could I live with it? Trust Kaffe to lead me astray - with the dollar being so good, this might be my last Kaffe purchase for 2010! I just might make some pumpkin scones tomorrow if I can find the recipe. Tidy Up - Lose Fabric! 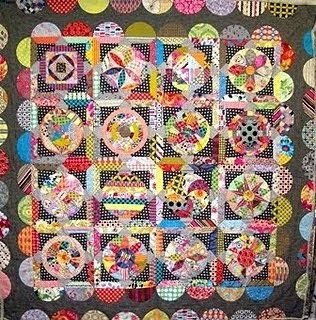 Oh, I hope not - it's been so long and I'm still not able to stretch my arms out - but just enough to put this quilt together for a finish! 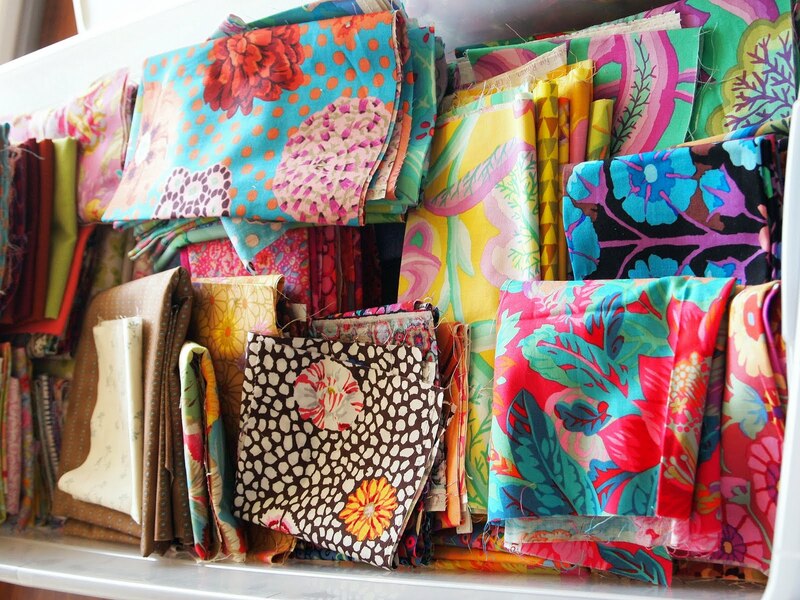 I think Heidi may have popped the box of fabrics I need under her bed for me last weekend in our big tidy-up I will have to wait for her to visit, maybe later today! 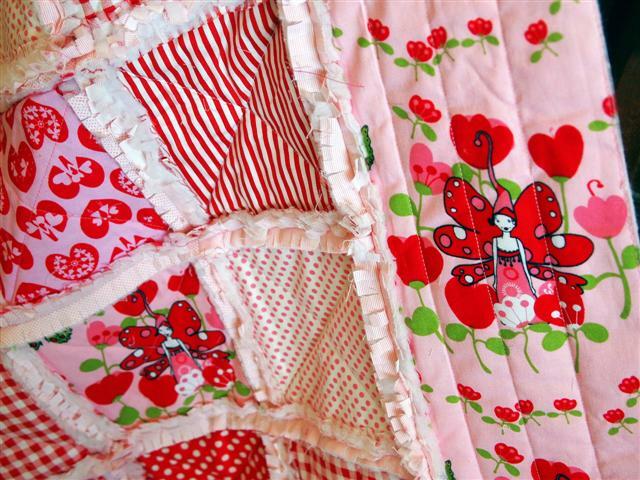 Heidi loves this raggy quilt and so do I! Maybe I will say it is for her and it can live at my place - we are still getting a few chilly evenings! I really feel motivated after a very busy week, so maybe a day of just playing about will keep me motivated for the week ahead when I have not so much to do! Oh, a big yawn! 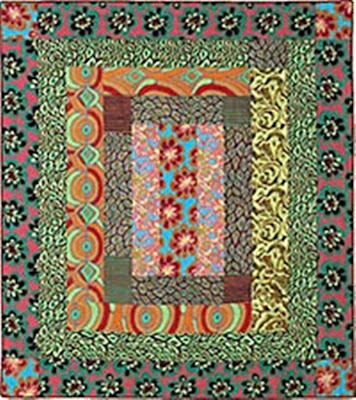 Those who have followed my blog for a long time will be very bored again - every now and then I get a request to see this quilt that sometimes sneaks into the background of a pic - Flowering Almond - it is my own design reproduced from a photograph . It now hangs in a museum in Michigan. 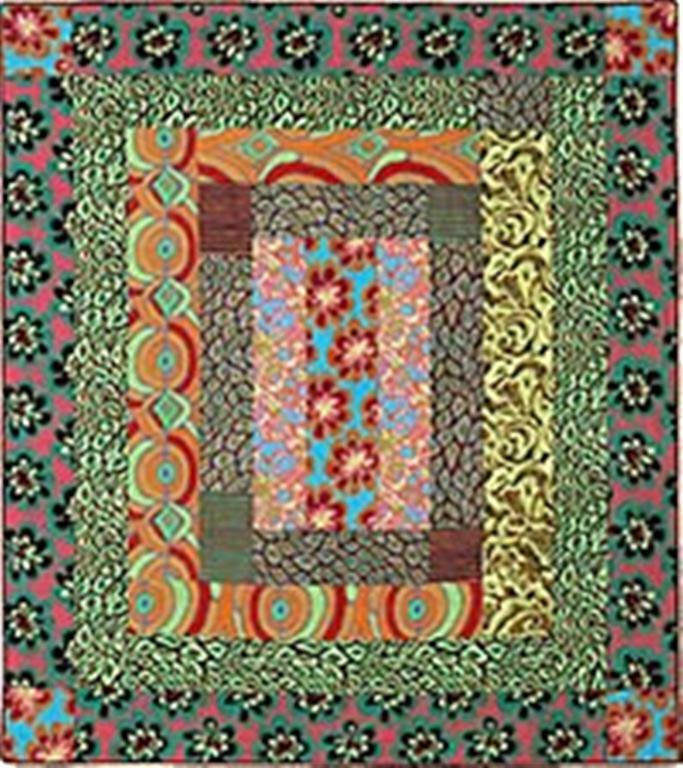 This style of quilting was fashionable in the 1840's - 1860's. I was so very motivated in the days when I made this, no grandchildren living close by and no mother living with me. Perhaps I didn't waste so much time either - newly retired and used to going like a rocket. 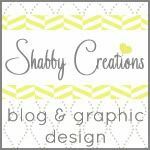 I'm have lots of plans for the week ahead - let's see what happens! I think that will be the story of my life - with what I have lined up ... maybe for the next 10 years! 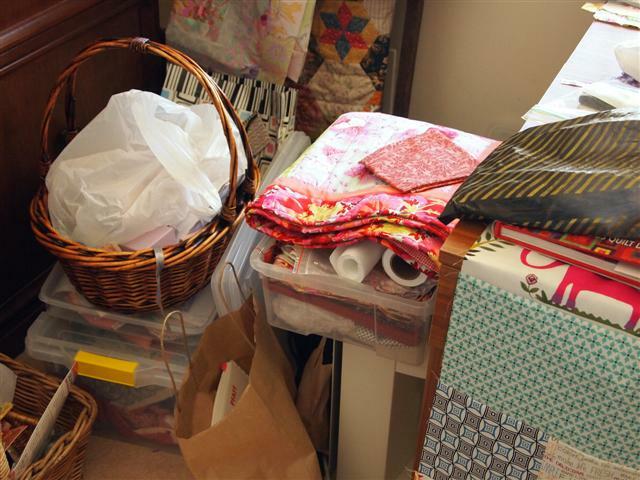 It won't be a messy story though - at last I am getting organized and can now see my way clear to find fabric, freezer paper, scissors iron and glue! 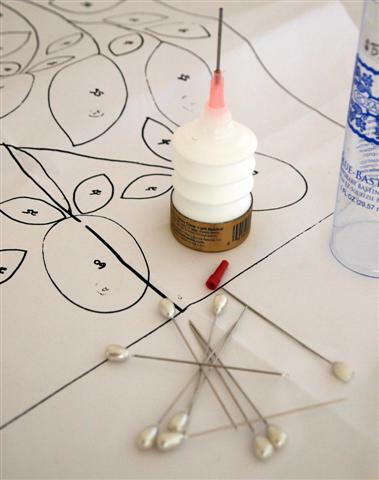 Speaking of glue - it is only in very recent years I have even used glue. I was reading Teresa's post - she lives at Fabric Therapy - she has been trying to find a way to unblock Roxanne's glue to have it flowing freely. In my tidy-up my latest bottle which is not very old nearly went in the bin - problem solved, I hope - I used a flower pin to poke down that little tube and now I'm sure if I keep the little red top on and a flower pin handy, all will be fine! 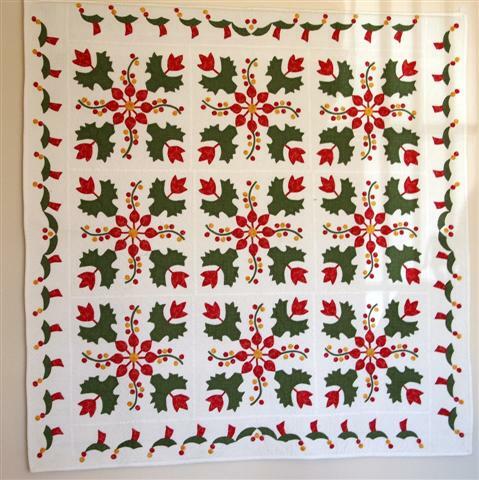 Not so sure about the Frosted Donut thread - just love it, a gorgeous fine 2-ply cotton just great for applique, convenient, too! However ... now it may just be me ... I have had a few problems. 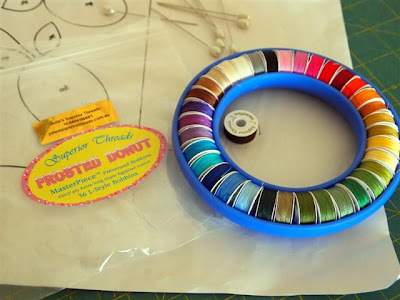 I think in the last few days I have had the cardboard spool edge come away three times on different colours - what would I have done if the thread had started to roll off? I popped a little bit of glue very close to the middle, pressed and held it with my thumb for a little while, sure hope it works. Another one, the purple, I couldn't find the start of the thread, had a little mess there for a while. I find I have to leave one of the bobbins out as they are packed in so tightly. Oh, dear - haven't I got all the trouble in the world on my shoulders, to wrap that subject up all I can say it is the nicest thread I have ever used for applique - any thoughts? See, I can stand at the end of my sewing machine table and select the perfect piece of fabric so easily - I really don't have a lot of Kaffe though I often get teased about it. Surely I can keep this long, shallow box tidy! Three of my favourites - for now anyhow! I Can't Deal With the Mess! Oh, I know what I should be doing and I did make a start! 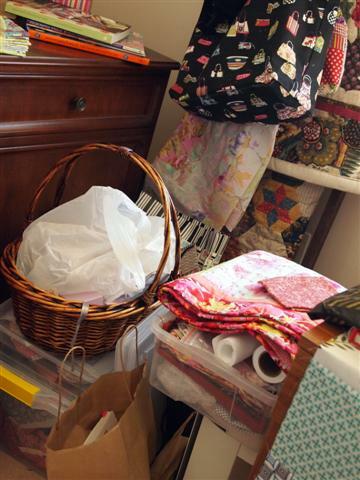 I started sorting bits and pieces into projects and have romanced this far - now I have a bigger mess than ever! How ever did I learn to love the colour 'orange'? A little more time needed and then I will launch into making this gorgeous quilt! Oopsy! 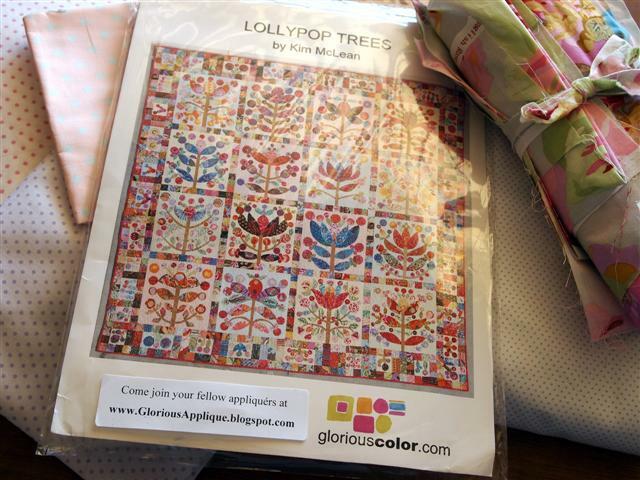 Colour's a bit dull - maybe I should have taken the plastic sleeve off. I know most of you know about the blog Glorious Applique . If not - check it out - a riot of colour and glorious applique! I have a little project in mind, should be fun! 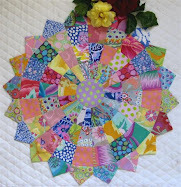 Lots of whimsy here - the pattern is for a raggedy quilt and you can see where to go for the lovely free tutorial! Though I haven't done many - I love raggedy quilts - very snuggly! And the bullseye, too - I have a retreat coming up end of November, maybe I will indulge myself in this project - hope so! Again a beautiful day - yellow roses symbolises sunshine and it also symbolizes friendship and caring. It's the perfect innocent gift to give to a friend or give to a loved one when you simply want to say "I care". When given to a friend it also means "I'm happy with our friendship". I have seen many other interpretations of the meaning, but this one makes me happy, a little message for you again Miriam. See the delicate pink in the back, top, right-hand corner - that's Seduction, the bush was given to me by Girlfriends! and DD Angela, raids the bush every time she comes around - so very beautiful, but doesn't photograph well - maybe one day when the blooms haven't been stolen, I will take a pic on a dark background! 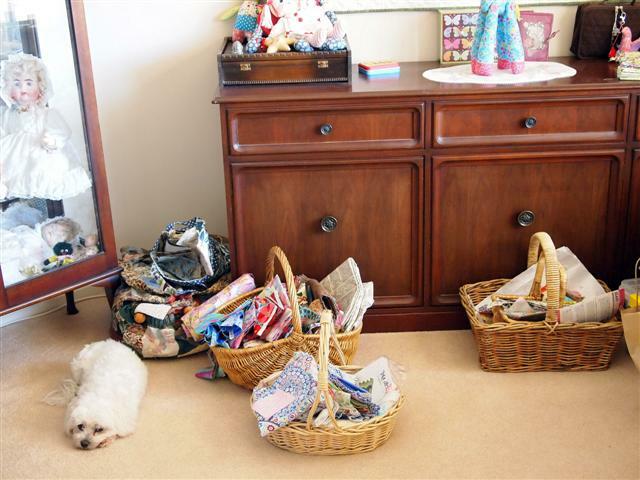 I've decided to do a 'mini tidy-up' before the Rugby League Grand Final comes up - happy afternoon! That's true, but that's okay - look what the mailman just brought me - a new BOM from Amitie Textiles and a new pattern I couldn't resist! 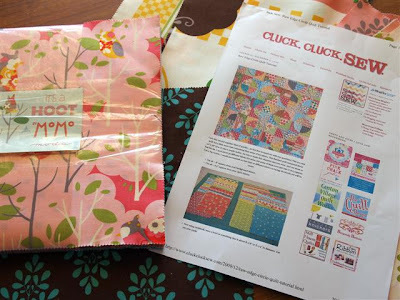 What a lovely way to spend an evening and weekend - I'll have a nice browse of the patterns this evening and I have my weekend all planned! 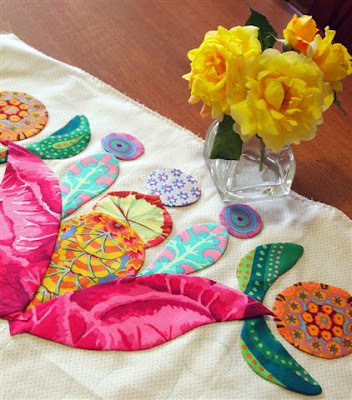 A little Glorious Applique will happen, too - a funny/not-so-funny little story to be told there. Oh, how gorgeous! 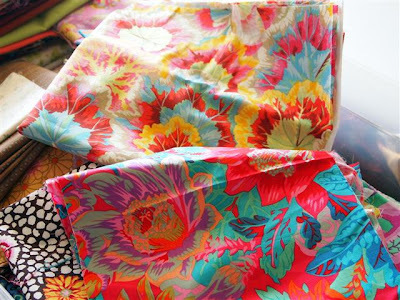 - a bright happy mood makes it even more exciting! This week has brought a few upsets and tears, but I can feel all the gloom slipping away very quickly! I think these pics tell their own story - very bold, but I am in that mood as I have been working with Kaffe's. 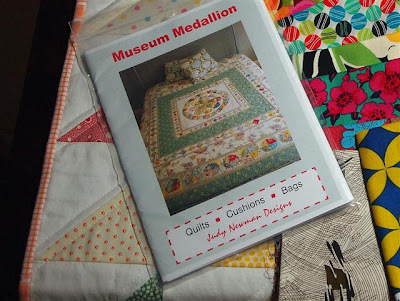 Love the look of this quilt, Museum Applieque - thought while I was ordering from Amitie I should get them to put the pattern in the parcel - it is certainly a beautiful antique design so should I get out of this bright, modern mode, I have lots of repro fabrics to use. My lovely friend Robin has machine stitched the binding on my gorgeous quilt below - now I give myself very little credit for this quilt, but I really do love it. 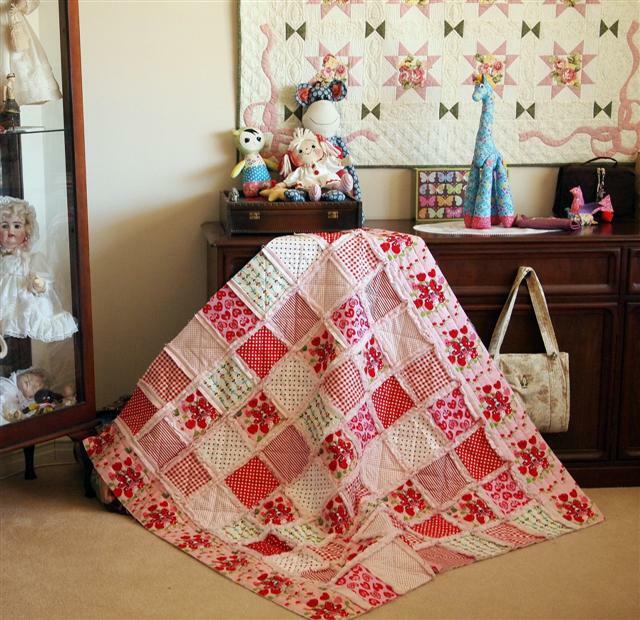 I was raised to believe self-praise is no recommendation and try to be humble about my quilting. Okay - design by gorgeous Kate of One Flew Over, most fabrics by Kaffe (they were out of the cupboard, too!) 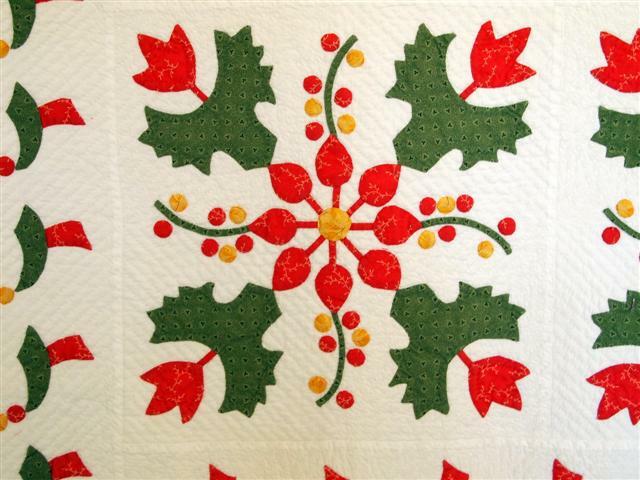 and quilting by Karen of Quilts on Bastings. It is certainly over-exposed on my blog - one more when it is hung hopefully over the weekend! 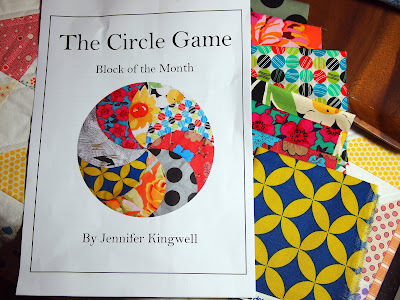 Hey, I did do the piecing and it must be pretty accurate as the circles are beautifully aligned, so I will take a little credit, lol! Mess! I am allowing myself 4 hours this afternoon to tidy up for once and for all - now I have my priorities sorted out I think there will be a little more quilting gear stored in the garage! I will need some big, strong arms to help me out!